Alex Lifeson talks about their upcoming Hall of Fame induction and the new, deluxe reissue of their 1976 prog-rock classic, 2112. Despite an intensely devoted fan base and decades of massive success, Rush have been, for much of their career, regarded as the World's Least-Hip Rock and Roll Act - the band of choice for adolescent boys mesmerized by 20-minute prog-rock epics, extravagant drum solos, and lyrics filled with tales of snow dogs, warring trees and French national holidays. In the past few years, however, Rush have come to be cast in a more laudatory light. They've been embraced by Hollywood on television shows like Freaks and Geeks and in films like I Love You, Man, and the band members - guitarist Alex Lifeson, vocalist/bassist Geddy Lee and drummer/lyricist Neil Peart - autographed Stephen Colbert's hand during an appearance on The Colbert Report. They have also been praised by a host of bold-name musicians and music fans - from Billy Corgan and Kirk Hammett to Jack Black and South Park co-creator Matt Stone - in the award-winning 2010 documentary, Rush: Beyond the Lighted Stage. Now, in what could be viewed as perhaps the final step in their mainstream image rehabilitation, Rush will this year be inducted into the Rock and Roll Hall of Fame, honoring in a very public way the myriad commercial and artistic achievements of the band's almost 40-year recording career. In that respect, it is also a fitting time for them to reissue their 1976 prog-rock classic, 2112, which represents a landmark moment in their commercial and artistic development. 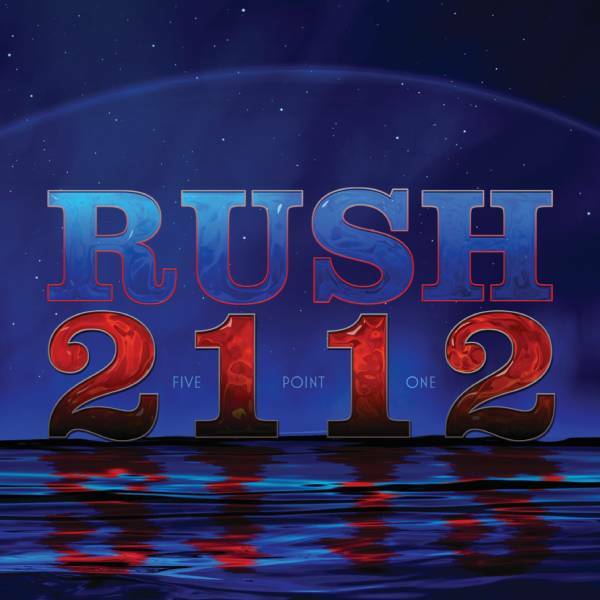 Rush's fourth album overall, 2112 has now been digitally remastered and stuffed with additional features, including live tracks, expanded liner notes, new artwork, unreleased photos and even a digital comic book. There is also a 5.1 surround sound mix, available in both DVD and Blu-ray formats, and a "Super Deluxe Edition" that boasts all the above add-ons and comes packaged in a hardbound book. That the record would be given such a classy and comprehensive update is understandable. As Lifeson points out, "2112 was the album that laid the groundwork for all our future success." Back in 1976, that success was far from guaranteed. Two years earlier, Rush had released their self-titled debut, a fairly straightforward hard-rock affair influenced by acts like Cream and, in particular, Led Zeppelin. The follow-up, Fly By Night, was Rush's first with Peart, who did much to push their music into territory that was both more literary (the Ayn Rand-influenced "Anthem") and proggy (the multipart "By-Tor & the Snow Dog"). At the same time, Rush began to cultivate a following throughout North America, thanks to incessant touring, much of it as a support act for Kiss. But then things veered off course. The band indulged its prog-rock proclivities to an even greater degree on 1975's Caress of Steel, to diminishing returns. According to Lifeson, neither the public nor the band's label, Mercury, seemed particularly enamored with Rush's focus on lengthy tracks, like the 12-minute-long song "The Necromancer" and the six-part epic "The Fountain of Lamneth," which consumed the entire second side of the original vinyl album. On the verge of being dropped by the label, and under pressure to deliver a more mainstream-friendly product, Rush doubled down on following their musical muse. The result was 2112. As with Caress of Steel, the effort features a massive, multi-suite song that boasts seven movements and spans more than 20 minutes. It's also the first track on the album and shares its title: "2112." Lyrically, "2112" is a classic tale of man's struggle for individuality. Peart's words conjure a futuristic society, lorded over by a ruling class known as the Priests of the Temples of Syrinx, that has been scrubbed clean of all creative outlets. When the story's protagonist unearths an old guitar and learns to play it, the priests reprimand him and the instrument is destroyed. The tale veers into tragedy-the protagonist is driven to despair and eventually commits suicide - but it ends on a triumphant note, with the priests under attack by an interplanetary onslaught and facing their demise. In crafting the words to "2112," Peart drew on his then fascination with author and philosopher Ayn Rand, in particular her Objectivist manifesto Anthem. But the subject matter also had clear parallels to Rush's predicament at the time. "Basically, '2112' was about standing up to the man and doing it your way," Lifeson says. "And that's something that we were absolutely dealing with in our own career. Neil managed to put it in the context of this incredible story, but it was about us as much as it was about anything else." The story - and the music - connected with fans in a big way. 2112 was Rush's first album to crack the Billboard Top 100 album chart and, in little more than a year of its release, became their first Gold-selling record. The title track itself ranks among the band's most beloved songs, and its second movement, the hard-rocking "The Temples of Syrinx," is a concert and classic-rock radio staple. The album also features five standalone and incredibly diverse tracks, including the alternately bouncy and brooding "The Twilight Zone," the sun-kissed AM radio pop tune "Lessons" and the almost-torchy ballad "Tears." Then there is "A Passage to Bangkok," which sports a pile-driving riff that might be the most traditional-sounding thing on the record, but whose lyric, a globe-trotting, first-person account of recreational drug tourism, is unlike anything else in the Rush canon. Indeed, 2112 is an ambitious and odd package: earnest to a fault in some spots, juvenile and jokey in others; incredibly technical and complex but also bare bones and rocking; not quite a concept record, but also not exactly just another collection of tunes. According to Lifeson, it is also "the first record where I felt we really sounded like Rush. Something shifted there in our sound and in the way all the elements combined, where it seemed like 'we were becoming our own band." Which is not to say it wasn't an occasionally bumpy ride from 2112 to the Rock and Roll Hall of Fame. In the following interview, Lifeson discusses the road to 2112, as well as its creation and the gear used in its recording. He also examines a few of the album's musical and lyric reference points (even learning a thing or two himself in the process), and talks about some of its aftereffects, from newfound success to accusations in the press of the band espousing a fascist worldview. Indeed, 2112 was a pivotal point for Rush. "We were at a place where we could either try to go back to what we had been doing earlier in our career and not be true to ourselves, or just damn the torpedoes and do our own thing," Lifeson says. "And truthfully, I don't think we could have possibly done it any other way. Looking back, it was of course the right decision for us. Everything that came after 2112, was possible because of 2112. From there, we continued on to always make the music we wanted to make. And then we just chugged along...for another 30 or so years." Prior to recording 2112, did it really feel like the end was near for Rush? It's been said that you took to calling the Caress of Steel tour the "Down the Tubes tour." As the story goes, prior to your recording 2112, Rush's manager, Ray Danniels, and your longtime producer, Terry Brown, actually met with your label, Mercury, and led them to believe that you were going to return to a more straightforward rock sound. [laughs] Of course they did! I'm sure they were saying things like that right up to the delivery of the record. They probably were like, "Don't worry, it's gonna be great! It'll be awesome!" But as the record was coming together we all truly were very excited about it. I don't know if we thought we had quite what we ended up with, but we did feel it was something special. Did Mercury ever put any specific demands on you to return to a more commercial sound? Not really. The essence of our deal was a production deal, so we were responsible for delivering the record, the artwork - everything - in its completed form. It was really up to us. But they did lament the fact that we seemed to no longer have the same interests as we had initially. And they were concerned about that. Of course they were concerned about that - they had invested a lot of money and time and effort in us. And they wanted only what was best for the band, which was for us to make them a lot of money! And that's fine. They're a business and that's what they do. I get it. That's okay. Truthfully, I think it lit a fire under us. The actual song "2112" was the most involved piece you had done up to that point. How did it come together? We entered the studio with that song in pretty close to final form. Or at least it was in pen sketches rather than pencil. But the truth is, we didn't really have the time available to us to go in the studio and write and record a record like we do now. A lot of "2112" was written in the back seat of a car and in cold dressing rooms while on tour in northern Ontario. Then it was just a matter of preparing ourselves and getting all the material ready. Then we'd go into the studio, spend a week recording and mixing, and that was it. You get back out on the road. I think the whole 2112 album took somewhere around a week to do. That's very quick. But we were recording live for the most part. Back then, you only had eight tracks. We might have had 16 by the time of 2112, but there wasn't a lot of space on those tracks. So you tried to record as much as you could in one go. We did the basic tracks live off the floor, which is really how we recorded right up through [1982's] Signals. I played mostly my [Gibson] ES-335, and I know I borrowed a friend's Strat, which you can hear on things like "Discovery" [Part III of "2112"]. So I had those two electrics in the studio with me, and then for the acoustic parts I had a Gibson Hummingbird that I borrowed from that same friend. For amps, I had a Fender Twin and a Marshall 50-watt and 100-watt. I'm sure I had a couple Marshall cabinets as well. My pedals were a Maestro Phase Shifter and Echoplex, and a Cry Baby wah. Can you recall what Geddy used? It would have been his Ricky [Lee's Rickenbacker 4001 Jetglo bass]. And probably Sunn amps, or else AmpegSVTs. But that was it. The gear was pretty streamlined, because we couldn't afford a lot. We had the tools that worked, and we took care of them. In that regard, from a musical standpoint, "2112" is actually rather raw and straightforward. As far as sidelong epics go, it's pretty accessible. I think that's because, really, it's made up of a group of songs. So there's variety, pacing, dynamics. There's an overall story, of course, but musically the sections break down into individual pieces. The  Hemispheres album [specifically the track "Cygnus X-1 Book II: Hemispheres"] is an example of that as well. The key was to make it so that there was enough going on to merit listening to these pieces as their own individual components. The sound of each movement of "2112" reflects what's happening in the lyrics. The song that makes this connection most literally is "Discovery," in which the protagonist finds a discarded guitar and sets about learning to play it. I approached my parts as if I was the character. I tried to get across the sense of, here's someone who has come across this thing and it's sparking the very same thing in him that it sparked in his ancestors, this creative energy. Something else I wanted to ask about was your copping a piece of the theme from Tchaikovsky's 1812 Overture for your solo in the "Overture" section of "2112." I was just kind of paying homage, you know? He had his 1812 Overture and we had our 2112 "Overture." It's our little nod to that. Maybe this is a real stretch, but I always wondered if there was more to it - Tchaikovsky's piece was written to commemorate Russia's defense of the homeland against Napoleon's invasion. In a sense, "2112" was Rush's defense of its artistic spirit against outside forces. You were both standing your ground. Yes, very much so! A fight's a fight, right? [laughs] So that's a part of it for sure. We were very aware of that. Here's something else: "Grand Finale," the final section of "2112," concludes with the phrase, "Attention all planets of the solar federation. We have assumed control." The first sentence is made up of seven words. The second is made up of four. Each is uttered three times. Mathematically, that comes to 21 words for the first sentence, and 12 for the second. 2112. Oh, I didn't know about that! No. But that's pretty cool! That's the first time I heard that...but yes, that's exactly what we were thinking! Absolutely. I had no idea. After the intensity of the first side of 2112, the second side kicks off with "A Passage to Bangkok." In addition to being a pretty straightforward rock song, it also features one of Neil Peart's more lighthearted lyrics. Basically, it's a drug tune. For sure. It's tongue-in-cheek. And that's always been an element of what we do. I think it's maybe more prevalent now than it was back then. But we still had a sense of humor. One thing that I always found particularly funny is that, while it sounds like a true story, the fact is that none of you had ever traveled to any of the places - Morocco, Lebanon, even Bangkok, for that matter - mentioned in the song. Was marijuana big for you guys? Oh, sure. I mean, we were very young, and we were products of the Sixties. So it was not uncommon, to say the least. Do you feel that in general the songs on the second side of 2112 get overlooked? Absolutely. And I think we in the band are guilty of that as well. We always think of that one song. But we loved the ones on the other side as well. "A Passage to Bangkok," "Something for Nothing," "Lessons"... And I've often wanted to bring back "The Twilight Zone," because it's such a quirky little song. It would be really cool to attack it again with sort of our new way of approaching our older material. After 2112 was released, how could you tell it was connecting with people? Did the size of the crowds increase? That was a very gradual thing. We went from playing small venues to playing slightly less small venues. And we just continued on that rise. We played everywhere, all the time. We played 250 shows a year, plus we recorded one or two records in that time. So we really worked a lot. And it was quite a slow build over the course of six or seven years. And I think that's a good way to do it. We could see that we were becoming more popular, that people were becoming much more connected with our music. But we still had no airplay. So even as it was getting bigger, it felt like we were this kind of cultish band. Even if that cult was growing bigger, the press still was not in your corner. Was it the NME that called you "pinko socialists" around the time of 2112? Actually, I think they were the ones that called us "neo-Nazi fascists." Well, that was an interesting time. I remember that interview we did with the guy from NME. He came to our hotel, and we had a nice conversation. There was an argument, and there are two sides to an argument. Neil took one position and the journalist took the other. And it was all in good faith. Just presenting two different opinions. And then the article came out, and it was, we're Nazis and we would sell our families up the river. And all we cared about was money and we were selfish. All this stuff. And that's not us at all. And Geddy's parents came through the Holocaust, so he was very, very sensitive to that. We were all very sensitive to that because of him. So it was kind of weird thing. But the NME was very much kind of a red, socialist sort of rag, and that was great press for them. It was the lowest of the low. But at the end of the day, I don't know where that journalist is, but we're still working! You've never been a critic's band, to say the least. Certainly, after a while we developed a tough skin, because most of the press we got was not very flattering. But we never cared, because we went out and played every night to sold-out audiences filled with people who really loved what we were doing. So it didn't really matter. And in some ways it's better that way, because you're not in the mainstream. You have some anonymity. But the tide has changed for Rush. You're finally getting into the Rock and Roll Hall of Fame, even though it took a long time. I think we've been eligible for the last 14 or 15 years. But our position has always been that if we're not part of that scene, that's okay. But I think for our fans, they were pretty pissed! And that's the thing about Rush fans. They're very vocal with their piss-iness. [laughs] So it's nice to have it happen. And we will go to the ceremony and graciously accept the honor, for us and also for our fans. We'll get up and play a few songs and make it a really special event. I know my mom's going, I think all our moms are going. They're pretty excited about it. Moms like that kind of thing. Moms love that kind of thing. So now that you're finally Hall of Famers, Rush fans will have to find another cause to take up. Well, there are certainly still lots of fans that are not happy with the decision to put us in the Hall of Fame. They feel that we should have stayed out. But it's not such a big deal. At the end of the day, let's all just be happy. At least you're no longer being called pinko socialist neo-Nazi fascists. Exactly! So there's a silver lining to every cloud. Like, "Hey mom! Look! I'm not a Nazi anymore!"